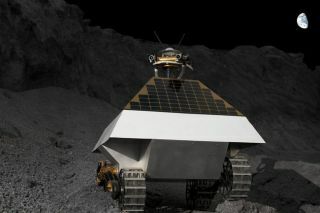 Ifthere's one name that's on the lips of many Google Lunar X Prize competitors,it's Astrobotic. The team boasts a name that readily conveys its ambitious aspirationsfor reaching the moon and beyond. "AstroboticTechnology is going to do a series of missions for scouting, prospecting,mining, and all sorts of things that robots can do to get ready for the human returnto the moon," said David Gump, President of Astrobotic. Winningthe Google Lunar X Prize requires teams to landa robot on the moon, move at least 1,640 feet (500 meters) and beam highdefinition views back to Earth. Theteam plansfor a pinpoint landing just over a mile from the Apollo 11 site, where NeilArmstrong became the first man to walk on the moon. Astrobotic's "RedRover" would then beam back high-definition images of the dusty footprintsleft by Armstrong and fellow Apollo astronaut Buzz Aldrin, all while takingcare not to disturb the historical site. Thatrover takes its name from team expert Red Whittaker, a famed Carnegie MellonUniversity roboticist who led his team to victory in the 2007 DARPA GrandChallenge. Astroboticalso gained serious financial muscle by partnering with Raytheon Company — aleading aerospace and defense corporation — to help establish itself as a long-termplayer in the race back to the moon and beyond. Carnegie Mellon University andArizona State's Lunar and Planetary Institute have similarly signed on. "Unlikeduring the Apollo era, it's clear to many people that the future of the lunarfrontier will be a mixed colony of humans and robots simultaneously," Gumpexplained. "Our goal is to be a company to which you can outsource things.You want to scout a landing site ahead of time, you hire us. You want to get asoil sample before sending your mining machines, you hire us. You need someelectrical power supply, we'd have a service." Potentialclients could include nations that would hire one or more Astrobotic rovers to gatherrocks and soil, as part of a prestige sample return mission. The team has alreadylined up at least one private client in Celestis, which announced plans to hireboth Astrobotic and fellow competitor Odyssey Moon to fly cremated humanremains to the moon. Theseries of robotic expeditions to the moon would also collect information tohelp build a lunar data library, Astrobotic announced last fall. Avision for Astrobotic grew out of long-time collaborations between Gump andWhittaker, starting back in 1989 when Gump headed the now-defunct Lunacorp andhad plans to place a rover on the moon. NowRaytheon and the other partner institutions have already poured over $3 millioninto the new endeavor, and the team looks forward to additional funding fromwealthy sponsors and eventually venture capital investors. Incontrast to teams that aim to take the X Prize with a budget equivalent to thefirst prize purse of $20 million, Astrobotic expects to spend several timesthat amount. Gump noted that a smaller budget could place mission constraintsby forcing the team to hitch a ride with another private launch, or reduce therover's capabilities to a short-term effort — not exactly in line with theteam's future plans to operate as an independent player in the space industry. Gumphas said that smaller entrepreneurial teams may yet capture the prize, but theteam would continue with its larger-scale effort.